Originally posted on Grammar Monkeys on June 18, 2009. It’s not quite a thesaurus and not really a dictionary, but this word reference is a useful book indeed. Subtitled “For when you know what you want to say but can’t think of the word,” the Flip Dictionary lists synonyms, groups of words or phrases, related words and definitions first so you can find exactly the word you need. For example, the book lists numerous synonyms for “emotion,” and then goes on to list, in separate entries, dozens of definitions related to emotion, such as “emotional tension after overwhelming experience, release of.” This way you can find “catharsis” — by looking backwards. Handy. If you know there’s a word for something — or another, better word — but you’re having a hard time coming up with it, this book will jog your memory. 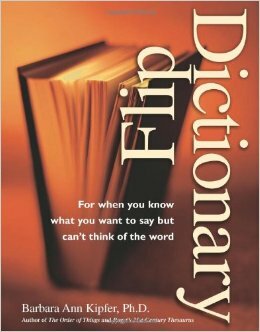 And for word lovers, it’s easy to get mesmerized, captivated or spellbound just flipping through the Flip Dictionary.